Swimming chlorine exposure has been linked to asthma and respiratory problems, and may even increase your risk of developing cancer. For a review of some clinical studies conducted on the effects of swimming chlorine exposure, see Chlorinated Pools May Increase Cancer Risk by Emily Sohn on the Science site for NBC News. However, that doesn’t mean that you or your children need to stop swimming. There are obvious physical exercise benefits from swimming, as well as the “blue space” effect for mental and emotional well-being. 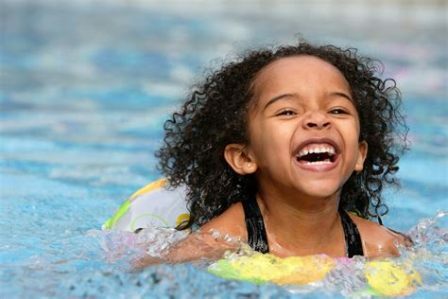 And then, for children especially, swimming provides many hours of a fun outdoor activity during the summer months. This is a benefit that many parents highly value for their children. Even though chorine is effective at killing microbes in swimming pools, the chlorine reacts to organic materials of all sorts in the water and on our skin and produces chemical byproducts, such as chloramine. As noted in the NBC Science article, one study identified over 100 chemical byproducts in the water, many of which were toxic. These toxic byproducts can get into our bodies through our skin. We also breathe in the chemical gases at the surface of the water. Swimmers breathe faster and harder and thus have even more exposure. In addition, babies and young children are more vulnerable to this exposure since their immune systems are still developing. The good news for those of us who love to swim is that there are viable ways to minimize swimming chlorine exposure. Avoid chlorinated pools whenever possible. If you swim in public pools, search for one that uses UV, ionization and/or salt water for disinfection. In general, these types of pools use less chlorine and other chemicals. If you have a choice between indoor or outdoor pools, choose the outdoor one. Indoor pools tend to have more chemical fumes trapped in the enclosed environment. If you own your own swimming pool and use primarily chlorine disinfection, you might want to look into switching to a UV or salt-based system to reduce chemical exposure. In my experience, the absolute worst exposure comes from chlorinated hot tubs and spas. The chlorine tends to be highly concentrated, the jets create a lot of spray (chemical gases) and you can just smell the strong odor of chlorine. Rinse off before and after swimming. When chlorine combines with bacteria, sweat, sunscreen, and other organic compounds on the skin, chloramine gases form. Thus, a quick shower rinse before swimming can reduce the organic compounds on the skin and saturate the skin so that it absorbs less chlorine from the pool. After you are done swimming, rinse hair and skin thoroughly with an organic soap or shampoo. You might also want to use a natural hair conditioner since chlorine can make your hair dry and brittle. Nourish your skin after swimming. Chlorine can also make your skin dry because it strips away the oily film that protects the skin from contaminants. Thus, applying coconut oil or grapeseed oil to your skin after rinsing off can help to rehydrate and combat oxidative stress. I also like to add a few drops of Vitamin E oil to the body oil to provide additional antioxidant support. I know that some health advocates recommend putting organic body oil on the skin as a protective barrier before swimming, which sounds like a good idea. However, most public pools expect people to wash off any oils or lotions before swimming because it clogs the filters or some such thing. In addition, I think the oil on the skin would also combine with the pool chlorine and contribute to the formation of chloramines. I don’t know this for fact, but it makes sense since chlorine interacts with most organic compounds on the skin. Thus, I don’t put any oil on my skin before swimming. Take Vitamin C. If you are swimming regularly, it is best to take vitamin C on a daily basis. I don’t swim regularly, but if I did I would take at least 1,000 mg three times a day. You can’t take it all at once because our bodies cannot absorb more than about 1000 mg at a time. Vitamin C (as ascorbic acid) neutralizes chlorine and chloramine and their toxic effects. Since our bodies do not produce vitamin C, we need to get it from food and supplements. Some of the best food sources of vitamin C include berries, citrus fruits, and green vegetables. It is also important to note that vitamin C works synergistically with both vitamin E and beta-carotene, according to Phyllis Balch, CNC, in Prescription for Nutritional Healing. Thus, if I were a swimmer or had a compromised immune system, I would definitely take all three in supplement form. Iodine supplementation. Healthy iodine levels will help prevent chlorine from collecting in the thyroid and causing numerous health issues. Iodine is an important halogen which will usually displace most other halogens, such as chlorine and bromine. Unless you are eating fish and seaweed daily, most likely you are not getting enough iodine in your diet to protect your thyroid. You can increase iodine intake through supplements and iodine-rich foods. The amount of iodine we need is debatable, but I believe we need much more than the RDA, which is just 150 mcg. Some thyroid experts recommend as much as 12 to 13 mg daily. However, it is critical that if you start taking iodine supplements that you increase the amount very gradually, starting with no more than the 150 mcg because too much at one time can cause a severe detox reaction. CAUTION: If you have any type of thyroid condition, consult your health practitioner or medical doctor before taking iodine supplements. In general, I believe the health benefits of swimming in chlorinated pools outweigh the negative effects of swimming chlorine exposure, especially if you rinse off before and after swimming and take vitamin C.
However, babies, young children or adults with suppressed immune systems are at greater risk, as well as those who are already prone to asthma, allergies, or other respiratory problems. Dr. Edward Group: 15 Must-Know Facts About Iodine.